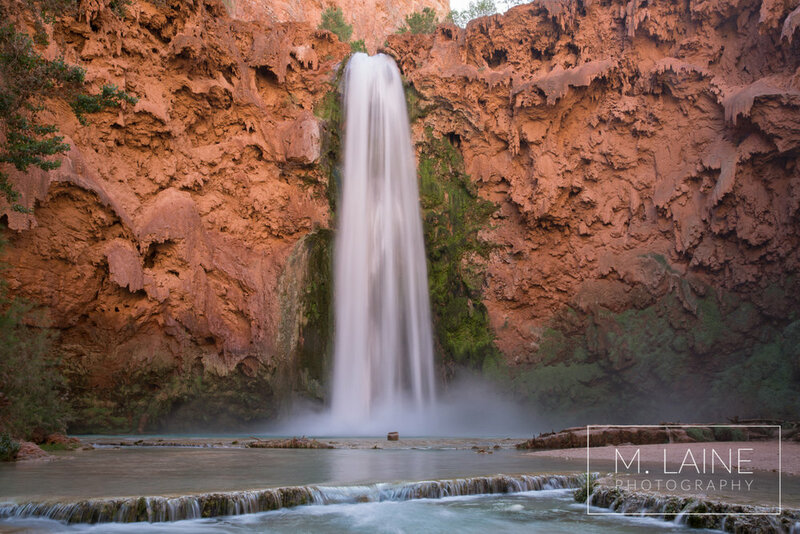 The falls is on the Supai reservation and requires permits to visit. Although the permits are reasonably priced, the competition to acquire them is fierce. Zach and I scored permits to the lodge when they didn’t have their online system up and running, so we got them the old-fashioned way — by calling 60+ times before we got through. Fast forward 10 anxious months of waiting for the trip. We flew in to Vegas, loved the drive on Route 66, and turned off the highway at dusk. During that final stretch of road to the trailhead we drove past more animals in one hour than most people see in years of driving. It was stressful, to say the least. We got to the trailhead late in the evening, packed our backpacks, and ate our first of many rehydrated dinners. Our group took melatonin to help us get to sleep in the car and be ready for the 4am hike down into the Grand Canyon (starting early helps keep you in shade for most of the hike), but we were all so uncomfortable and anxious that no one slept more than a couple hours that night. Since we arrived at the trailhead after dark and started hiking in the dark, we had no idea what our surroundings looked like until we were in the bottom of the Grand Canyon watching the sun rise. It was here that the trip first felt surreal. Every turn through the canyon was stunning. When we got to the reservation lodge where we were staying, I was happy to put my 32-pound pack down and eat lunch from the Supai village café. Members of our group weren’t doing well in the heat, so we took it easy resting in the village and enjoyed our only warm showers of the stay. Turns out the lodge’s water is solar heated and usually runs out of warm water by early afternoon. Even though we had just hiked into the Grand Canyon, the next day’s hike was the longest yet. It included a total of 10 miles to get to Beaver Falls and back. Our first stop along the way was Mooney Falls. To reach the bottom of Mooney Falls, we went down the sketchiest chain and ladder system I’ve ever seen. The metal stairs were wet from the waterfall’s mist, and the posts that held up the chains as hand holds wiggled if you put too much weight on them. Once down the ladder, finding the stokes basket ready and waiting at the base of the ladder was less than thrilling. At the base of Mooney Falls, we’d only hiked three miles so far. Two more miles to get Beaver Falls, and another five to get back. We’d slept in, so by the time we were halfway there, the sun was high and the shadows that kept us from overheating were long gone. The last two miles stretched on. We were thankful for the river crossings and dipped our feet in every chance we got. Finally, we made it to Beaver Falls! It was worth every step in the 90-degree heat. We ate lunch sitting on the ledge of the falls, played frisbee in the pools and took in our surroundings. We all agreed that Beaver Falls was our favorite place of the entire trip. By the time we made to the trek back, the sun was casting shadows again, and for that I was thankful. We made it back to the village in time to buy ice cream from their only store. We considered our third day at Havasuapai our rest day. We hiked a total of four miles to see Navajo and Havasupai Falls. I loved climbing on the rocks in the water at Navajo Falls and swimming in the pools at Havasupai Falls. Zach would have stayed there all day if we had let him. After our experience hiking in the heat going to Beaver Falls, we knew the importance of waking up early for the hike back out of the Grand Canyon. We were all dreading the possibility of hiking up the canyon wall in direct sun. Thankfully, that fear motivated us to start our hike at 5am. On our hike out, we only suffered in the sun for a half hour, and that was brutal enough. We made it back to the car by 10am, and the dream-like state I experienced hiking in stayed with me for the whole trip. I still can’t believe I had the ability and privilege to visit Havasupai. It was the trip of a lifetime and worth every step. Use one of the images below to save this to Pinterest.